He said, Go, Daniel! For the words are closed up and sealed until the end-time (not in the Bible, to be revealed). Many shall be purified and made white and tested (the spotless Bride). But the wicked shall do wrong. And not one of the wicked shall understand; but the wise shall understand. Besmirch: V. Damage the reputation of (someone or something) in the opinion of others. Staff: N. A rod or scepter held as a sign of office or authority.? I was taken back a little when the Lord said, “Staffs of silence” That is why He said, “yes, Staffs.” I understood the importance of silence and I understood what the Lord had revealed about His staff. This was a new picture! In the following I will try to make things plain as the Lord said, illuminating what is already presented in the “Golden Meetings” Booklet. The Lord began calling us His “Staff” quite often. I for one thought it neat that He was doing this, but had no idea where He was taking us. This was not hard to understand because this group had come to be doing what a “staff” would be doing for anyone in a leadership position, like the head of a corporation. We served the Lord as His “staff” in doing Judgement Meetings and anything else He revealed we were to do. We continued learning about being His “Staff.” We would call meetings when He said to and so on. He was running this ministry and giving us more understanding of our position in the earth! The Lord was making the position, we were just obeying. Another thing the Lord had been doing was to bring some people together on the internet from different parts of the USA who were doing individual Golden Meetings and had rid themselves of the three spots. These people were meeting on corporate phone calls once a week to discuss the “things of the Spirit” everyone was receiving. The “Hill site” was created. I found in our records that on 1-13-2013 the Lord had revealed I was to ask the group that was meeting together and recording their “things of the Spirit” on “the Hill” site if they wanted to be on “the Lord’s Staff?” The Lord revealed we were to have everyone sign their names to the question on the site, that it was a legal issue. The Lord said it was a serious thing. We made sure everyone understood that they were then obligated to the Lord with their promise - not us. The next main event was the Conclave the Lord instructed us to have and written about in the Portrayals That God’s People Need To Understand article. I wrote about the Portrayal portrayed in the meeting, but here I need to reveal some more about what the Lord did and revealed. For years the Lord has told us we were a prototype, but He always revealed there were positions not filled. During the time of the Conclave the Lord revealed the prototype was complete. I knew it was complete as far as numbers go. During those nine days of having Golden Meetings twice a day (for the most part) a comradeship was developed among this larger group of people. The Lord had said there would be fifteen people picked by Him in the meeting. We had fifteen exactly, but we learned that husband and wife could be counted as one. We came to understand that we could have had more people than fifteen, that the Lord considered man and wife as one. The Lord’s Word reveals that man and woman become one when married and man cannot change this. It is a legal issue in the spirit realm. The number fifteen is significant as God does nothing without a purpose. The next major change came when the Lord revealed He wanted this larger group (His Staff”) to have all our meetings on the internet. We have been doing Corporate Golden Meetings and Judgement meetings online since then (1-8-2014). When the Watchman saw, “we establish that staff,” “We declare war,” was the Lord talking about a “staff” like Moses had or something else? God performed miracles through Mose’s staff and in this writing I will give witness of God performing a miracle through His first Staff of Silence. 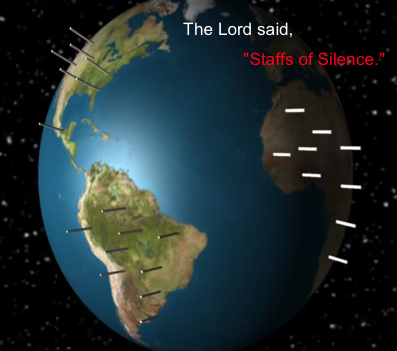 As you can see from the picture at the beginning of this article the Lord wants these “Staffs of Silence” to multiply in the earth. So listen carefully, He has the plan! 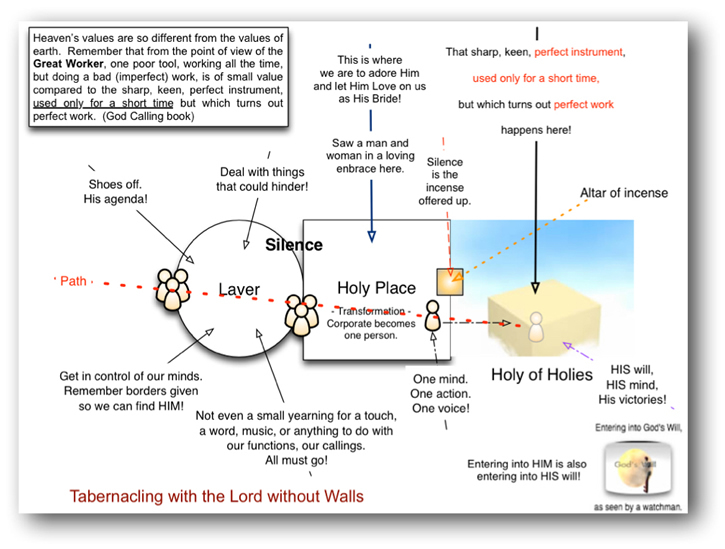 The Lord said to make things clear, so here I present important information and some illumination concerning silence before we get into the miracle the Lord performed. If you have read the Golden Meetings, and I Saw the Holy of Holies Booklets you know the Lord said that He is in the silence. That silence is necessary because He is Holy! That He works in the silence! The Lord revealed that a person has to practice silence, Golden Meetings according to the boundaries that He set. One of the things the Lord has said over and over and over is. “I do much in your silence!” When the Lord showed me about imploding into Him through silence and obedience He gave me this picture, pictured in the Golden Meetings book. The Lord referred to this as Fusion. The white in the center was Jesus moving like lightening from one end to the other in the people’s silence on the narrow path depicted in red. The narrow path depicts Jesus’ commands! There are twelve people in the scene. The Lord told us, “More people, more power!” Notice how much Jesus can move or do in the line of twelve people. One time my wife and I were having a Golden Meeting together and I saw two people in the fusion. I knew Jesus was dealing with me about how much He could do even with two people. Now think of how much more He could do with a hundred people in silence and us obeying. The more people the better! I will share more of the girl’s circumstances later. We didn’t learn of them until after the Staff of Silence meeting. It’s best not to know. Remember the Lord said, “picture it / make it plain,” so we will take some time in this section to include some insights. When we got the information about the girl needing prayer I immediately sent the information to the larger group, the Lord’s Staff who holds Golden Meetings with us on the internet. My wife and I prayed for her and later I began thinking about her and I said something about doing her "back debt." Another person who is in the group had contacted me about this same possibility. We knew it was important, so my wife and I decided to ask the Lord for Beti's back debt and pay it for her, using the instructions the Lord had taught us years ago. Then a member of the group on the internet contacted me and was suggesting we get the group at large together to pray for the girl. Another member and I talked about praying for her and he said to me, "Yes, I prayed for her the old fashion way." He too brought up that we ought to lift her up the new way the Lord has taught us; a silent meeting with the corporate group. We began contacting the members at large on the internet and we setup having a meeting on the internet, although not everyone could attend. Once we were all in the meeting on the Internet I started the meeting by lifting up the girl (by name) to the Lord. We washed at the Lord's Laver in His blood, all in silence. We then waited on the Lord. After a long period of silence I asked for reports on what people had received. It was all typed into our computer screen so everyone could see the instructions or picture presented by the Lord. Person 1 - She has something seared into her that needs to be removed (like a cattle brand). Person 3 - Saw a huge fist from an arm swinging down at the girl's head. Her head was being flattened with the huge fist. "Mind captive"
Person 5 - law of increase at work / healing. We declare it to be so, in JESUS' Name. Person 6- Wipe the slate clean, Tell her it's a new day and they heard the song, "Lord, Infill Us With Your Holy Spirit." After receiving the above information I read down the list. One by one we performed what the Lord had revealed; everyone in the meeting speaking and doing what was suggested by the Lord on each bit of information that was received. The following is a small overview, but you can see the picture. Person 4 - Saw a huge fist from an arm swinging down at the girl's head. Her head was being flattened with the huge fist. "Mind captive"
We declared her mind set free, with other words given. We took her to the Lord, speaking against the fruit spoiling. More things were said here among the group as they were inspired. Person 6 - law of increase at work / healing. We declare it to be so, in JESUS' Name. We declared (in JESUS’ Name) the law of increase was at work and that healing was taking place. Person 7 - Wipe the slate clean, Tell her it's a new day and they heard the song, "Lord, Infill Us With Your Holy Spirit." We declared her slate clean and we also declared it is a new day for her. We then sang the song inserting Beti's name into it (where appropriate). Another thing BN was told by the Lord was to mark the time. It was 7:28 PM CST on March 28, 2014, the Lord has told us several times to mark the time when we do these type meetings. We didn't begin the deliverance until we had read the last instruction and discussed the information. See how it all flowed together? Nothing was said from ourselves other than what the Lord instructed us to do and say. I will tell you that after the meeting the Lord let it be known He was pleased with what we had done in having the meeting for Beti. There is a picture here I want to bring out. 1. We had very good silence when we opened the meeting by washing at the Lord's Laver. We were silent for a while. 2. We all heard the Lord's instruction. 3. We performed the Lord's instruction, not adding anything or leaving anything out. 4. The Lord did His part and He could because of the main elements silence, instruction and obedience, nothing more. Going back to the sequence of our Staff of silence meeting for this girl, I led the people down through the information given by the Lord. In a later meeting I had each person speak and do what the Lord had given each of them. Each person acted out their own information going down the list one by one. Everyone joined in to what each person presented. Everyone was involved and this is important to understand. It was certainly correct to do it that way in that particular meeting. In another meeting we had silence and received instruction. In that instruction the Lord said, “extended silence.” “Start over” was given with an act we were to do. We were told to shout "hallelujahs." So we started over by washing at the laver again and went into silence with the idea the Lord would reveal when it was long enough. When the Lord revealed it was enough we did the action and shouted "hallelujahs" as we were doing the action. This was the same general pattern the Lord used at the Battle of Jericho. I have shared these things to give some insights into variations that can occur. It takes practice as the Lord revealed and it is a continual learning process.